Wrexham joint top scorer Marc Williams is expected to miss the rest of the season with a broken foot suffered in Saturday's 1-1 draw with Salisbury. "He's done brilliantly [for us]... but football has a habit of slapping you in the face," said manager Dean Saunders. "You've got to get through it, we'll look to replace him now. "We've got no-one like Marc so we have to try to find a player who will complement those we have at the club, make an impact and score goals." 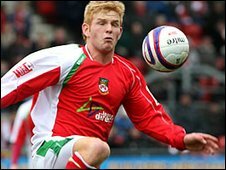 How big a blow is Williams' loss to Wrexham? Wales Under-21 international Williams has scored 17 goals for the club this year, while Saunders has highlighted problems in front of goal as one of the promotion-chasing Dragons' major failings. "We could have got a lot more [points] with the chances we've created," said Saunders, whose team travel to Crawley on Tuesday. "Salisbury was the same story. Three of the goals that we missed will be on a Christmas video somewhere. "I'd be more worried if we weren't creating the chances, but we've got to finish teams off."